I don't read as much as I used to, but I say once a bookworm, always a bookworm. 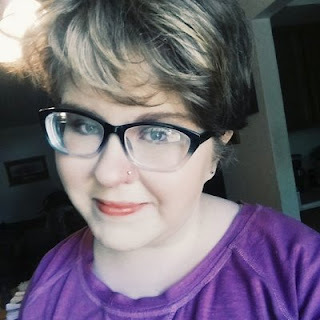 Being the bookworm that I am, I've read a TON of books, and as I was trying to figure out what book to write about today, I realized that there are few books that really truly impact me. There are good books that I read that I will remember as being good. But as I think back over them, nothing really sticks out in my mind about them. Don't get me wrong, there are books that I loved while I was reading them, but none of them have really stuck with me as something I need to read over and over again. I realized that's because they have high standards to look up to. I was very young when I first entered the magical land of Narnia. My dad had a habit of reading to me before we would go to bed - we would read chapter books, and take the time to read a chapter each night. We read the majority of the American Girl books, the whole Little House on the Prairie series, and The Hobbit. Then one day my dad pulled out a different book. One about four children and a wardrobe. I entered the magical world with Lucy and have never looked back since. After that, it took me quite a while to realize that there were more books to the series. I always wondered at the cryptic ending of the series, "and that was only the beginning of their adventures in Narnia." I had no clue that there was more to the series - 7 books to be exact. But one day when I was poking around in the basement, I found the books. THE books. The books that, once I read them, added to the way I saw life, adventures, and my Savior. I was about six or seven at the time, and I devoured the books, then promptly passed them on to my grandmother. We both loved them. Two years later, the first Narnia movie came out. I. Was. Ecstatic. As a true and devoted Narnia fan, I went to the theater with high hopes, and was not disappointed. I remember walking out of the theater, feeling totally enthralled and still wrapped up in the magic of the movie. I imagined I was Lucy as I walked out of the theater and all through the day, even going so far as to make a wardrobe out of a giant cardboard box that we got with our new water heater. It was as tall as I was, and we made a little door in the back so that we could imagine walking into Narnia. That box holds many fond memories for me, and I remember dressing up in a plaid skirt and knee socks to add to the effect. My siblings had so much fun in that box. It was almost like a whole world of its own. All three of the movies have gotten my seal of approval, but the books will always, always have a special place in my heart. Because of Narnia, the love of Jesus and his excruciating yet beautiful sacrifice have become all the more clear to me. Because of Narnia and the writings of one amazing man named C.S. Lewis, I have been impacted forever. And because of Narnia, I have been inspired to write my own fantasy novels and live my own great adventure - the one called life. 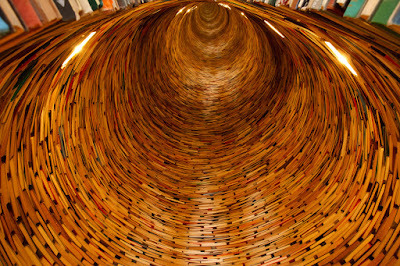 This is literally a tunnel of books. I want one. Btw, I love Narnia too. It's so wonderfully written, so magical. And I agree, the analogies are beautiful. I agree, the Narnia books are some of the best out there. That book tunnel is so cool! I want one, too! 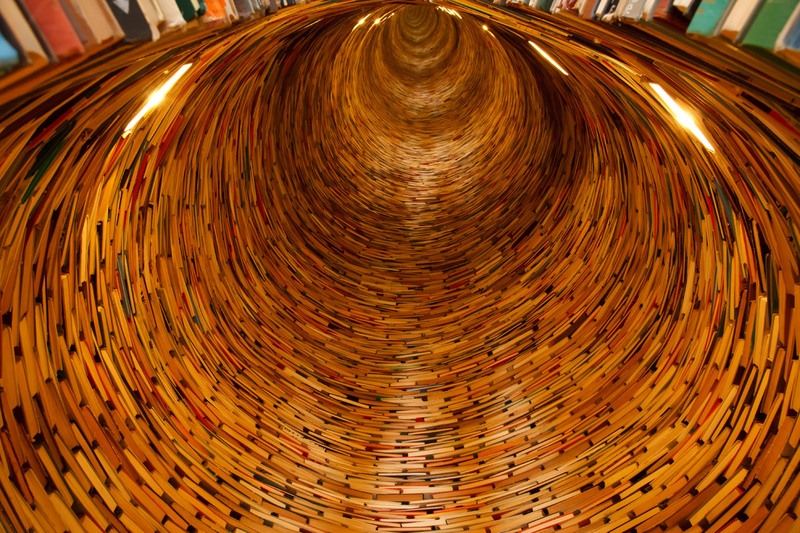 That book tunnel is awesome! I enlarged the picture and simply soaked in the amazingness of it all.